Requests for Sage Cloud Hosting Surge, Learn Why! Join Cloud9 as we deep dive into Sage hosting solutions. Lean how to save money while increasing productivity. We host every version of Sage software.presently supported. At Cloud9 Real Time, we are always assessing data and trending popularities of software applications that business owners and managers are asking to have hosted on their private virtual servers. This allows Cloud9 to remain current and informed as to what clients are seeking from their Cloud9 services plan. Sage cloud hosting is a case in point. 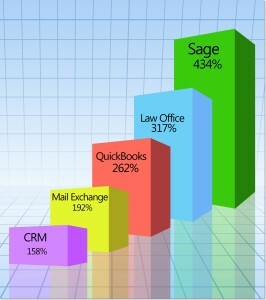 While we have realized dramatic increases in overall cloud computing and hosting orders as business owners, and the world at large, hear about the significant benefits of cloud computing, this radical increase in requests specifically for Sage cloud hosting is a distinct relative shift, made all the more dramatic when you realize that orders for all other software application hosting have increased by only135% on average. Relatedly, orders for other business productivity, communications and customer management applications have shown a distinct upward trend of growth, notwithstanding. From Sage North America: Sage 50 Accounting Cloud Hosting Providers like Cloud9 Real Time eliminate the burden of deploying and administering Sage 50 on your network by your staff. Reduce your hardware and IT costs because your Sage 50 solution is being maintained and backed up at a secure off-site location.